1 IN 4 IN Required logos are always displayed in a 4 x 1 in block. Color of block can be changed based on color scheme of design. 0.97 IN MCC Presents will always be displayed at the top left corner in a 0.97 x 1 in black box. Text must remain white. Color block is the same dimensions as the block on the front. 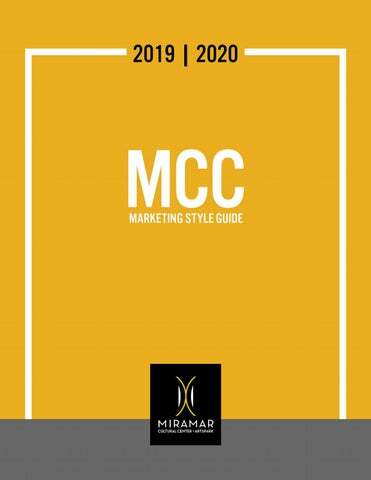 MCC address and information will always exist in the color block along with theatre logo. Theatre logo will always be displayed on a black rectangle and shown knocked out. The images will be updated with the images for upcoming shows.